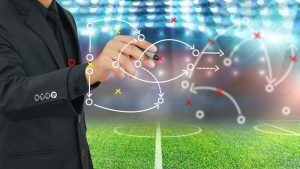 Although football season is over, the game’s basic functions provide a reasonable context for evaluating the inner workings of your Customer Care communication approach. To effectively apply these functions, we must understand what they are. The team charged with carrying the ball down the field to score plays offense. Defense attempts to prevent offense from accomplishing that task. I would like to propose that we think of the ball as the Customer Experience, offense as change, and defense as status quo. The game also comes with special teams, managers, coaches, trainers, and owners; this is a structure replicated in most businesses. When it comes to Customer Care/Contact Centers, consider evaluating your operation in these terms. It could be fun! First of all, ask yourself … Does our operation play better offense or better defense? Are we innovators? Are we willing to challenge our own belief systems in order to search for new and creative tools and techniques to improve on fulfilling the Customer Experience promise? My experience in this industry is that the answer is no; in far too many cases defense has crippled offense. Unlike football, the roles of offense and defense in business are adopted rather than assigned. Often the position is grown into. It is driven by habit, fear, exhaustion, poor leadership, neglect, turf battles, and a slew of other dynamics that undermine any genuine offensive skill. The condition is typically evolutionary and often positions offensive thinking as revolutionary! I view defense as among the most dangerous communication mechanisms. Defense is the foundation of the status quo, or should I say the facilitation of it. Status quo often manifests in a defensive stance associated with things like bringing in hidden agendas, contributing to project stalemates, blocking optimization of technology, inhibiting add-on sales initiatives, and just about any anti-offensive tactics. Defense has a detectable language … “That will never work here,” “We tried that already,” “We can’t,” “Our people won’t,” “THEY (whoever they are) will never allow it,” “We’ve always managed just fine,” etc., etc. Defensive arguments use words like always, never, and can’t. This is the language of pessimists. Rather than engaging in discussions of pros and cons, these folks throw down the gauntlet of “opinion.” They consistently choose opinion over expertise and stand by their defensive position no matter what it takes. A strong defense translates to those folks that often play “devil’s advocate.” While insights are welcome, this positioning rarely reflects curiosity. The devil’s advocate rolls in the obstacles to create fear, uncertainty, and doubt; this protects their comfort zone. The result is stalled initiatives. If you look closely at a stalled project, you will notice indicators of defensive positions within Customer Care/Contact Centers as well as cross-functionally. For example, take the Contact Center that is pummeled by marketing and promotional campaigns that it was not privy to prior to launch. The responsible party (Marketing, etc.) justifies not informing the Contact Center because of “security” or some other lame reason. This represents cross-functional defense! The Contact Center must then act offensively. Management must calculate the cost of a poor response to a campaign or promotion because there was no time to plan, staff, or train for an effective response. The cost here is more than contacts lost or mishandled. It also includes the impact on the morale of the frontline agent; it is not fun to appear stupid and that is exactly what they experience. If the Customer Experience is the ball, Marketing has no business adopting a defensive position. Any internal “trust” issues are hallucinations enjoyed by those that need a defense for their negligence of the Customer Experience. I seriously doubt that there has been a marketing campaign worthy of industrial espionage (of course I could be wrong). It is wrong at the Customer Experience offensive level to assert a lack of cross-functional trust to defend a broken communication path. Defense is dangerous when it is quietly adopted as the means by which we lead. If an environment is detected as too much defense and not enough offense, leadership needs to take a step back and indict themselves. Leaders set the course; morale and culture are reflections of leadership. Defensive practices also inhibit the elimination of poor quality players. I have witnessed far too many organizations in which even the worst offenders (from an attitude and contribution perspective) are tolerated and even protected from elimination because of some false sense of commitment. An offensive commitment is to the Customer Experience. Any resources, including humans that contaminate rather than contribute to that objective must be removed from the assignment! If you defend a flawed retention practice within your culture, GOOD LUCK because it will ultimately be your downfall. Defense often manifests as silence, as in not speaking up and not showing up. When conditions within any business unit are flawed and recommendations for change are made, there is a problem if your first response is to argue against it inside your own head. Far too many staff hide their true feelings about situations, conditions, or initiatives from everyone but their “posse” … those that have “water cooler” conversations where all the doubt is safe to disclose. There is another aspect to this dynamic manifested by silent adversaries that ignore meetings and abandon project milestones, deadlines, and tasks related to initiatives with which they disagree. In addition to pessimism, we detect passive aggressive behavior which is very unpleasant to experience. If you add to this the previously-mentioned culture of retaining the wrong people, making any kind of change becomes very complicated. Taking on the offensive position requires being open, curious, proactive, and optimistic. Leadership’s offensive adoption provides forums for ongoing evaluation, education, and action. The offense is constantly learning new, more creative “plays” to challenge the status quo and determine regularly the best and most effective methodology to deliver on the Customer Experience. This means that offensive players read industry information, feed their professional curiosity, inspire others to contribute, and appreciate individual contributors for what they have to offer. Offense has strict hiring criteria, understands competency requirements, and does its best to influence hiring using its highest performing staff as a model. It protects itself from being the business unit in which redundant resources from downsized departments within the enterprise are “assigned.” The offensive position has established hiring requisites; while those resources may apply, they are subjected to the same criteria as any other applicant. Defensive leaders just shrug their shoulders, accept the staff, and whine about it to others. Offense craves innovation and always asks … How can we make things better? What are we learning about our customers’ needs and preferences? What new or existing technology do we need to know more about? The leader is the quarterback whose job it is to set the standards of behavior for the team. If there is no quarterback, and just a lot of defensive lineman, the ball will not move. Defense will win the day and the Customer Experience, the revenue, and the brand will be sacrificed in the process. Which team are you on … offense or defense?